There is widespread support for deploying low-carbon sources of energy. However, when new, renewable and distributed energy technologies enter the electricity market, they are often not directly competitive with existing fossil-fuel based technologies. The right incentives can level the playing field, bringing renewable energy technology to market and spurring investment and technological innovation. One of the most impactful incentive opportunities for generating significant growth in renewable energy technologies, particularly wind and solar, is the feed-in tariff (FiT). 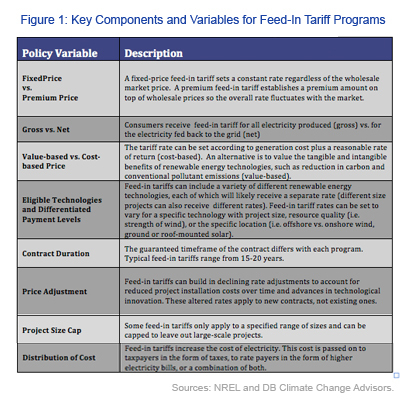 Feed-in tariffs guarantee renewable projects a set payment for every kilowatt hour of energy produced – often a fixed rate above the “brown power” price to help overcome the higher upfront capital costs of many renewable energy technologies. FiT programs create a more secure and attractive environment for both developers and financiers of renewable energy projects by setting a known price for renewable energy. Through FiTs, both small and large renewable energy developers are assured market entry and an attractive purchase price for their products. FiTs can be structured in a number of ways that incorporate varying levels of flexibility, cost and certainty. The figure below outlines the major elements and variables within FiT programs. The policy design and criteria in each FiT significantly impacts its overall effectiveness as an incentive. Over the past two decades, more than 45 countries and 20 cities, provinces and states have implemented FiT programs. Many of these governments have experimented with a variety of structures, continuously refining them to drive greater investment and project development. The Spanish and German FiTs have proven successful, as evidenced by their related growth in renewable energy. The renewable energy market growth experienced by these two countries has influenced other countries to replicate their models. 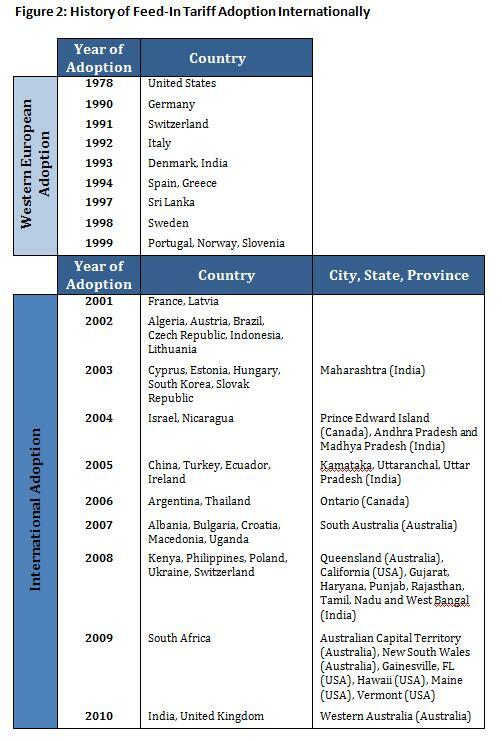 The timeline below shows when each country, state, city and province adopted its FiT program. Germany was the first European country to adopt a feed-in tariff program in 1991, with a tariff based on a percentage of the retail rate of electricity. Denmark and Spain implemented their versions of this model in 1993 and 1994, respectively. The tariff level was set based in part on the perceived value of avoided externalities, including coal plant pollution. The ‘premium’ tariff, however, did not account for fluctuating electricity costs, and many investors were not comfortable with the resulting uncertainty and unpredictability. Project financing costs, as a result, remained relatively high and market growth limited. Furthermore, the tariff price was not set high enough to cover the costs of solar photovoltaic (PV) projects. In 2000, Germany and Denmark altered their FiTs to cost-based models, in which rates are set based on the cost of generation plus a reasonable rate of return. These governments mandated grid access for renewable energy, guaranteed payments for 20 years, and offered differentiated rates based on technology, project size, resource intensity, and application.1 The inception of these “advanced feed-in tariffs” established a new level of precision in setting rates for renewable energy deployment. Many countries, including Spain and France, have since adopted this model. The shift from value-based to cost-based FiT programs and from variable to fixed-rates established an investment environment with long-term certainty and stable, consistent returns. This new recipe was the catalyst for the dramatic renewable energy growth witnessed by Europe, particularly Germany and Spain, over the past decade. The rapid renewable expansion in Europe also spurred international attention, as nations around the world began prioritizing low-carbon technologies for economic and environmental purposes. China, India, South Africa and other large carbon emitters have all implemented FiT programs over the last five years. Altogether, FiT programs in Europe, China and India are now in place for 2.5 billion consumers. 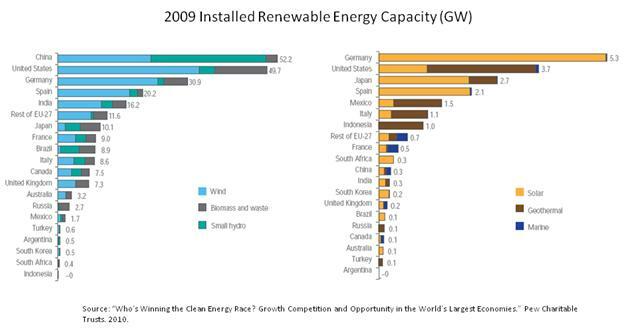 The figure below shows renewable energy capacity in the most mature markets. While the North American investment and production tax credits have made America a global leader in wind development, FiTs in Germany are viewed as having played a major role in driving widespread growth in solar energy. In many places where FiT programs have been established there has been a corresponding growth in renewable energy. It is difficult to quantify the exact impact FiT programs have had on individual markets, however, because tariffs are usually adopted as part of a broader suite of climate and energy policies, such as carbon legislation and renewable portfolio standards. These policies all attempt to level the playing field by making the externalities associated with fossil-fuel based energy (greenhouse gases and pollution) bear a cost in the market. FiT programs serve to effectively complement these policies by increasing the volume of renewable energy and subsequently driving down project costs. The ultimate goal of these policies is to speed the process of grid parity to reach a point where incentives are no longer necessary. 1 Gipe, Paul, “Evolution of Feed-In Tariffs,” Windworks.org, March 18, 2009 [http://www.wind-works.org/FeedLaws/EvolutionofFeed-inTariffs.html].